I have this idea I want to discuss. Well, actually, blogs don't really discuss things very well, since a discussion is implicitly two-way communication. I'll rephrase: I have an idea I want to write about, and you're going to sit there and read. Ok, fine. The idea is this: new usage models only happen when used articles are recycled. Revolutionary, I know; about like saying that the world is round. Rather obvious sounding, perhaps? First, I would like to talk about the word "articles". Here, I don't mean to refer to pieces of clothing. I'm really talking obliquely about individual items of technology, such as tape recorders, video cameras, old computers. And cameras. Take, for instance, a Polaroid Model 800. Well, fancy that; I just happen to have one here with me. It was a gift, really. From some well-meaning but photographically - how shall we say it? - naive relatives, who thought I could find some practical use out of it. Now, before we get into the details of the camera, let's (actually, that's 'let me') discuss the use of the term "recycled". Again, this is a turn of a phrase, since I don't actually plan to package the camera and its accessories (did I mention accessories?) into a recycle bag and drop it off on the curb. Actually, I at one time thought of that very deed, but repented, certain that my innate ability to reuse and cobble together would come in handy someday. No. To me, the phrase "recycle" really means that the product or item no longer is useful for its originally intended purpose. Meaning that, by the standards of the marketing universe, the item has passed into what is obliquely referred to as "obsolescence", a polite term that really implies "product death". However, implicit in the term "recycle" is the concept that, somehow, the item has been recovered or rescued from a certain death in a landfill, and has found new life, a second life (we may open up at this time various spiritual references to resurrection), implying that a new use for the item has been discovered. This is perhaps a good place to touch on the concept of the "product life-cycle". This concept is the clever creation of the manufacturing industry, whose primary job it is to convince us, its intended victims, that products have specific, pre-defined usage modes, and a specific product life-cycle, after which it is incumbent that we participate in the Renewal of the Annual Corporate Ingathering of Revenue, by the purchase of a new product, thereby perpetuating ad infinitum the product life-cycle, a tradition dating back into the dark recesses of the industrial revolution. A bit arrogant of these chaps, to think that we're not clever enough to figure out new and creative uses for things. Which touches on the main point of this writing: that only through the process of reuse can creative uses be found. Or, to rephrase: creative uses for items of technology are found only if they are broken out of the product life-cycle, unchained from the technology treadmill. Think of it this way: these are mere tools, that's all. Just tools. But somebody who makes and sells these tools is telling us that we can only use the tool for so long, after which we have to buy a new tool from him, and we can only do certain, predefined things with the tool. Really. It sounds like what we're being told is that we really are no longer human beings. That homo sapiens has been extincted, replaced by homo consumerus, a creature no longer capable of being a tool-making, tool-using, sentient creative individual. Okay, so back to the camera. It's a large, grayish, off-white contraption, folded down to about the size of a medium hardback book. Once opened, the gray colored bellows is slid forward until the front lens board clicks into position. The lens, with built in shutter, is calibrated in "EV", or exposure values. There's a shutter button, with a little switch labeled "B" and "I", and a hot-synch connector, for use with an external flash. On the back of the camera there's a viewfinder, next to which is a split-image type of rangefinder focuser. Below the bellows, under the base that serves as the camera's door when closed, is a focusing knob and distance scale, which not only focuses the lens, by expanding and contracting the bellows, but is coupled to the split-image rangefinder. There's also the obligatory hot-shoe flash connector on the top of the camera. The funny, and sad, part is that, for all of its friendly soundingness, Mr. Wink Light won't work, not without replacing an archaic 48 volt battery inside the light housing. Sure, I'll just hop on down to the corner store and pick me up one of them 48 volt batteries. Opening the camera, one finds a rather strange arrangement of multiple hinged light-proof panels, with metal rollers. One has to keep in mind that this is a Polaroid camera, although not of the variety seen in recent years. No, this camera is from the early days of instant film technology, where the resulting prints were black and white, and one had to coat the completed print with a gooey, clear gel of fixer, before the picture faded. This camera uses two spools, one for the paper negative film, and the other for the print paper with incorporated chemical developing agents. Both were loaded in the camera, with the paper film roll going over the film platen, around a roller and behind, where it was sandwiched with the print paper from the other roller. Together, both layers exited the camera in a sandwich. 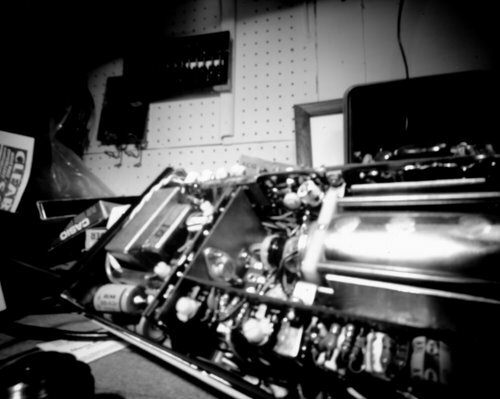 After exposure, the user pulled the dual-layer sandwich out of the slot in the side of the camera body, and tore off the end of the leader. The action of pulling the film caused the chemical pods in the print paper roll to be squeezed through metal rollers, which had the effect of smearing this gel-like chemical into the space between both layers. Film in hand, one waited the appropriate amount of time, during which the gel developed the negative image on the inside surface of the paper negative, and also transferred a positive version over to the print paper side of the sandwich. The operation was complete after both halves were peeled apart, and a gel-stick of gooey fixer was applied to the print, making it permanent. Of course, it is important to remember that this is all technological antiquity, of the sort one encounters when visiting the Amish in eastern Ohio and learns of the finer points of properly dressing a horse-drawn buggy. Interesting, but perhaps less than useful. But my intention this fine day was to take this relic into the darkroom, open her up, and tape a 4" by 5" rectangle of black and white photo paper to the inside surface of the film platen, pointing towards the lens. Then, once closed up, I would take the camera out into the daylight, affix it to a sturdy tripod, set the shutter to bulb (remember the "B"? ), and make a timed exposure onto the extremely slow, orthochromatic (i.e. blue sensitive) paper negative. Which is exactly what I did. Not once, but many times over. Taking careful notes, and light readings with my meter, I was able to calibrate timed exposures in both direct daylight, and shaded daylight settings. Portraits done of my wife and grandson, in the afternoon shade of the north-facing porch, were timed for 8 seconds. I thought about those 8 seconds, during which time the sitter (quaint term, is it not?) had to do so in perfect stillness, unless one's countenance be blurred and indistinct. This is no longer the domain of 1960's era instant photography; rather, this is historic, bringing us back to the post-civil war era, when such ortho emulsions were coated on paper and also glass plates. Sitters of that day needed head braces to keep them still enough so as to render their finer features distinct. I don't think they sell head braces in Walmart's photo department. The resulting portrait images taken with the reused Polaroid Model 800 camera, loaded with paper negative media, are very nice. The orthochromatic tonal range provided by the paper delivers a, shall we say, "tropical" skin tone, which reminds me of why, back in the early days of cinema, filmmakers who were limited to ortho film stock would paint up the actor's faces with white powder, no doubt some indirect allusion to some subconscious racial stereotype. I thought of those "tropical" skin tones rendered by the paper media. Were the techniques of this project to become popularized, the fashion industry would be abuzz with this new-found cultural metaphor. Need to look beach-tanned for that next portrait session? Why risk skin cancer when all you need do is sit under the all-seeing eye of the orthochromatic paper negative. In retrospect, what I find most fascinating about this project is how two distinctly dissimilar yet antiquated technologies - early Polaroid cameras and black & white photo paper - when creatively combined can bring new life to both. There is no evidence that the engineers and designers of either technology ever foresaw the merging of their respective diverse areas of photo science. Instant cameras and darkroom paper have little in common. In fact, they are - or were - supposed to be sworn enemies of each other in the marketplace, with Polaroid's intentional business model to make obsolete altogether the conventional darkroom. Somehow a truce was signed between the warring parties, peace was made, and creativity once again flourishes. A new usage model has formed from discarded technology, and I am the better for it. There's a recent trend being noticed in the world of photography, brought to our attention no doubt by the pervasive presence of the internet discussion forum. And no, this trend has little to do with multi-megapixel cameras. In fact, if the computer were not the means of social interaction one could almost believe this was happening in the beginning of the last century, rather than the present. The trend I am referring to is the phenomenon of the home-built camera. Building one's own camera may, to some, seem as anachronistic as, say, fabricating a working clock from a pile of discarded lumber. It's certainly not as romantic as rebuilding an old Mustang or refinishing Aunt Mabel's sideboard table. And then there's that inevitable question of 'why'. Why, indeed, when each year there are more cameras being manufactured of all types - film, digital, disposable, cell phone-embedded - than there are people to use them. Considering the sophisticated design and manufacturing science involved in the global trade in image-making equipment, there must be more going on here than merely fulfilling a desire to take pictures with a device crafted by hand. Perhaps we should step back a moment and consider this phenomenon more carefully. Who are these people anyway, and what kind of cameras are they building? Well, I, for one, am an example of one of those camera builders, so I may have some opinion on the matter - albeit somewhat biased. I did not awake one morning, suddenly bolt upright in bed and proclaim "Eureka! I'm going to build my very own camera today!" My story was rather an evolution, one that started in the mainstream of amateur photography, in the late 1970s. My visual sentiments gradually changed with time, as I went from shooting 35mm Kodachrome slides, to desiring a more hands-on involvement with the materials of the monochrome darkroom. Paralleling this change of focus was the sense that the 35mm frame was too diminutive in area within which to capture the essence of my vision. 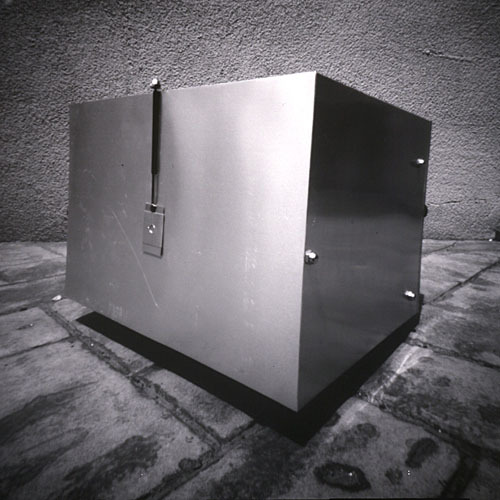 So I found myself not only assembling the tools of the black & white darkroom, but my hands-on experience with the photographic craft directly led to the inspiration that would illuminate my path for years to come: the pinhole camera. Although the smallest of film formats can, in theory, be applied to the pinhole technique, direct experience and the mathematics of pinhole optics both suggest that larger formats yield greater detail, more delicate and subtle tonal values and less artifacts of the medium. Thus, borne by the necessity to put into practical use cameras of more extensive film sizes than the mainstream, I quickly came to the necessity of having to fashion by hand an object to serve as a functional pinhole camera. Thus began my camera-building adventure. To be sure, I started out like many others with the obligatory cardboard box, darkened with spray paint on the inside, and a scrap of aluminum drink can, pierced with a sewing needle, for a lens. 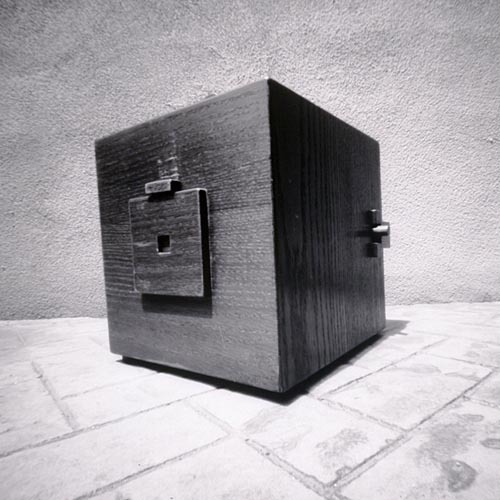 Not that any other type or configuration of pinhole camera is necessarily any better, or can produce better images. I must remember that I still use cameras of just that description, even now, so many years later. What drove my desire to continue building other pinhole cameras was mainly about making them more functional, and also exploring various format sizes. From a practical standpoint, a box camera is capable of taking but one picture, at which point in time it is found necessary to, somehow, reload the camera. Large format cameras for years have solved this problem with the development of the sheet film holder. I could either buy some, or make some. Instead, I chose to design a different type of camera, one that wouldn't require the additional burden and expense of toting around a stack of film holders along with a large box camera. Thus was born (or rather, rediscovered) the falling plate camera design. I built a large wooden box, constructed around an inner space frame, that contained a mechanism permitting a stack of flat film boards to be stacked vertically in the back of the camera, whereby the front-most board, subsequent to exposure, would be permitted to fall, face-down, in the bottom of the camera, revealing the next film board ready for exposure. That, in a sentence, sums up notebooks full of sketches and diagrams, and countless hours of thinking and constructing and testing and rebuiding, in a cycle of continuous improvement. Others have found inspiration in camera building by recreating the classic designs of the bellows-type large format view camera. Fashioning by hand a tapered, collapsable camera bellows is no small feat, especially considering that there are but a handful still manufacturing such instruments, and the subtlety of detail required has mostly died out with the passage of time. Perhaps most amazing of all is that there appears to be, in this day and age, a real resurgence of interest in 19th century photographic processes and apparatus. This is no less amazing than the possibility that scores of people, independant of one another, suddenly were struck with the passion to craft fully functional Model T Ford replicas, from hand-hammered forged components, in their backyard blacksmith shops, and then proceed to drive their handmade cars to work each day. For these people who are passionately pursuing handcrafted, large format photographic equipment and processes are also putting them to use every day in the exercise of their creative vision. In an age when image making has become de rigor to the culture at large, this can be seen as nothing short of a revolutionary reaction to what has been an unprecedented campaign of mass-manipulation, in the marketting of a plethora of image-making products that seem to be closer to the heart of the engineer than the heart of the artist. 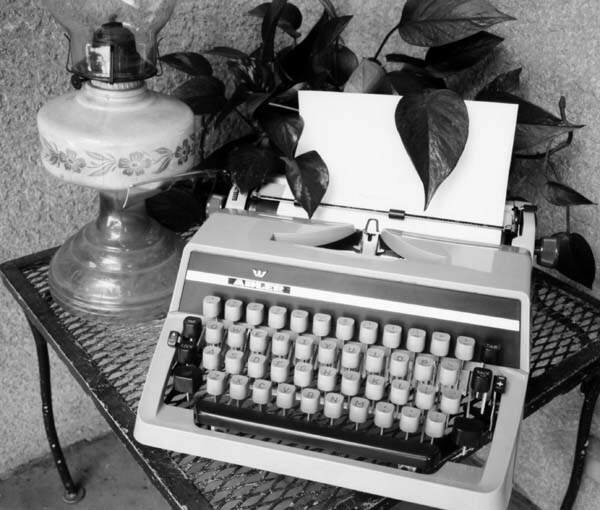 Today I began thinking about manual typewriters. That's a rather odd statement, about like saying that today I began thinking about recipes for gruel or mead. This line of thought was precipitated by a purposeful intent, which was to construct a still-life composition with which to test a new photographic media. For my intent is to craft an "improvised lens" box camera, that uses the medium of black and white paper negatives.Prior to the detailed work of fabricating such an intricate and archaic instrument, I thought it appropriate that both the optics and the paper media be tested for functionality. As an improvised lens, I found an unused enlarging lens in my darkroom, a Rodenstock 105mm Omegaron f4.5 lens, with an aperture adjustable from f4.5 to f22. Initial tests with this lens against a white sheet of paper gave promise that it would provide adequate coverage for a 4"x5" film format. 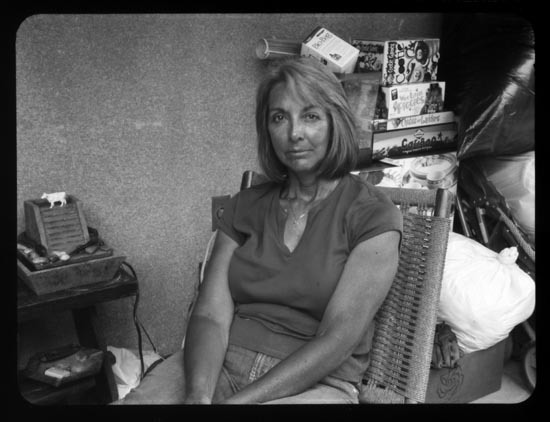 My paper negative media of choice is the usual Arista grade 2 resin coated photo paper, preflashed in the darkroom with a slight sensitizing exposure of 5 seconds from a specially calibrated light source. This procedure I have developed through many years of struggle trying to getting good tonal range from black and white paper media mounted within pinhole cameras. Since the box camera has yet to be designed and built, I had to find a way to combine lens and paper into a usable camera. My trusty Graflex Speed Graphic camera came to the rescue, a functional relic from WW2. I removed the Kodak 127mm Ektar lens board, and installed a home built aircraft plywood lens board, attached to which is the now re-enlisted enlarger lens. Opening the diaphragm to f4.5 gives enough light to adequately compose an image on the ground glass view screen, while stopping down to f22 gives wide enough depth of focus, and adequate illumination with a darkcloth over one's head, to accurately focus.After some initial calibration exposures, I felt confident enough to attempt a quality still-life setting. Enter the Adler manual typewriter. The Adler sits on the corner of my office desk, a relic from the cold war, as this well-built tool was manufactured in what was known as West Germany. There it sits, poised in direct opposition to the keyboard, monitor and optical trackball of my desktop PC. Almost as if in its silence it speaks forth volumes, the mere presence of this writing instrument, that requires no electricity to function, is a constant distraction, like some object of meditation one would find on the desk of an executive. I periodically ratchet a sheet of paper through its platen and type up a letter or note, fascinated by the uniqueness of each imprinted character, no two of which ever look exactly alike. Like some baby grand piano the operator can modulate with infinite delicateness the degree of imprint of ribbon upon paper, using just the slightest variation in finger pressure; a kind of visual music, kept in perfect accompaniment to the rat-ta-tat-tat of each letter upon the rubber roller. I've long been fascinated with visual compositions that feature the dichotomy between the natural and man-made worlds, for in that troubled interface lie the evidence of many present-tense issues. Using this as a que, I arranged the composition you see illustrated here, the result of a scan of the resulting paper negative. I am pleased and excited by these results. The Rodenstock lens, stopped down to f22, appears to have adequate depth of focus for close-up settings, so it should be adequate for landscape scenes as well. The amount of detail one can coax out of a well-exposed paper negative is impressive. Holding the negative in my hand, I am amazed at the level of detail and micro-contrast evident. I must attempt a contact print soon, for I am anticipating being equally impressed with those results, too. I have spent this afternoon perusing the pages of old journal notebooks, some dating back to 1998. As if unearthing and opening some long-lost time capsule, I find a mysterious interest in exploring these dated personal musings. But first, I must recall that these notebooks themselves possess their own story, aside from the mere words contained within the mechanical pencil scratchings. The first notebook I examine is a composition book, with a cover of plastic, laminated to a cardboard inner liner. I had begun to notice, after having used this comp book for awhile, that the cover would dramatically warp, when left in the heat of an enclosed car in the hot, summer sun. So I composed a complaining email to the maker of the notebook, explaining my displeasure in the manner in which the plastic cover, laminated to a paper liner, showed a differential temperature expansion of such an extreme nature. I was impressed by my argument, but supposed nothing would come of my complaint. Imagine my surprise when, a few weeks later, a package arrived in the mail, containing a stack of college-ruled comp books with the traditional, non-warping heavy cardboard cover. I began at once to use these books as an ongoing journal of my inner thought-life on the subjects of the visual arts, photography, and low-resolution, despised video formats. Through a background as a professional consumer electronics technician I had gained an interest in exploring the low end of the technology spectrum as a potential intersection point with the historic roots of cinema. Thinking about the technical requirements for creating a black and white silent film, for instance, one becomes immediately impressed that all the equipment required to produce a movie equivalent to a mid-1920's silent film are contained within the plastic enclosure of the consumer-grade camcorder: mere jump cuts, no need for lip-syncing of audio, no special effects necessary and lack of color temperature problems. It would appear that sub-format consumer grade video is firmly grounded as a creative tool for cinematic expression. And that is just what I wrote about in those journals. Along with the prosumer grade Super-VHS editing VCR as a tool for creating the final assembly of in-camera footage onto a finished S-VHS master tape, I also advocated the use of a micro-cassette audio tape recorder for the collection of various location sounds and narration, to be later included into the finished video production. My interest in "U-cass" tape recorders dates back to the mid-1970s, when I purchased my first tape player at a military base exchange overseas. Much derided for its apparent lack of fidelity, the U-cass format has survived to this day, and all of the tapes that I made in the 70s are still playable today, with virtually no loss of fidelity. In the era when these old journals were written - the late 1990s, a seeming technological lifetime ago - mainstream consumer video editing had already transitioned to the computer-based formats, so even then it seems that I was already exploring the role of the technological pariah. I had the opportunity to make a talk to a local university film class on creative video production using low-end, despised formats, and also conducted a seminar on low-budget video production sponsored by Basement Films, a local micro-cinema organization. I had developed, throughout the pages of those composition books, the basis for a solid philosophical foundation to support my belief in lo-fi A/V, and felt motivated to evangelize the nascent film community to my new-found approach, which was so out of place in the cutting-edge culture of the media studies crowd. So what has become of those numerous ideas for creative videos in the domain of lo-fi A/V? Many of them did become finished productions, with an equal number having never been realized, or merely residing in various dormant states of incompletion. The biggest challenge in the future is ensuring that the hardware itself remains in a state of repair such that these tools can be once again powered up and modulated with the harmonious waveforms of the low-resolution, despised audio/visual electronic formats of the past. And perhaps therein lies the key to my fascination with this obsolete technology: recording sounds and images using the equipment of an earlier era provides a tangible yet ethereal connecting thread with the ever-present past, that resides in those memories so near and yet so very far away. Having perused various photography discussion forums it becomes evident that photography, as a broad field of image making, is becoming more fragmented and categorized. This fragmentation becomes manifested as diverse areas of specialization, genres of particular and unique fields of endeavor, often enhanced by specialist discussion forums. We see examples of this in fora dedicated to specialized or peculiar cameras: pinhole, DIY (Do It Yourself), rangefinders, medium format, large format, ultra-large format, toy, subminiature format, folding, antique, plate, 35mm; specialized photographic processes: digital, analog, black and white, color, enlargements, contact prints, Polaroid, infrared, alternative processes (gum oil, cyanotype, gum bichromate, carbro, wet plate collodion, daguerreotype, salted paper, albumen, bromoil, collotype, platinum, palladium, Van Dyke, etc. ); specialized usage modes: landscape, documentary/street, portrait, glamour, still-life, sports, weddings and events, photojournalism, advertising, snapshot, fine art, etc. Some would argue that this breaking apart of photography into numerous specialized fields implies a process of fragmentation that is evidence of the decline of the medium. This argument is reinforced by the numerous and often tiresome "flame wars" that erupt over the issue of digital verses analog, for instance. As an aside, it must be mentioned that discussions of digital verses analog are not necessarily intrinsically useless arguments; the problem arises when people unschooled in the finer points of media studies attempt to insert opinion for fact, or simply speak on subjects of which they have little or no practical experience. In an attempt to gain further understanding, I would like now to compare the current state of photographic media with the marketing end of the automotive industry. In the year 1930, a person who desired to purchase an automobile had few choices. The choices were usually a Ford model A, and one could choose any color car as long as that color was black. Contrast this with the current state of the automotive industry. Not only are there other brands to choose from besides Ford, but there is a virtually uncountable assortment of various models and styles and colors to choose from. The industry has also stratified the model selections into large-scale categories, such as "Sport Utility Vehicle", or "Mini-Van", or "Subcompact", or "Mini-SUV". The automotive industry is not only a mature, post-industrial phenomenon, but it has succeeded, despite its problems, to infiltrate the very fabric of western culture. The individual in American culture is more dependant than ever before on the culture of the automobile as a vital necessity for engagement in activities essential to a successful lifestyle. The stratification of models and features illustrates, not the decline of the industry, but its very success. And so it is, I believe, with the photography field. Our society is awash in image making, and new tools and usage models for image making appear almost daily. We have witnessed, over the last forty years, the decline of the photo-pictorial magazine spread, but this has only been a displacement. What has taken its place has been the rise of television imagery, and now internet-based imagery, all of which is essentially photographic in nature. New tools, such as cell-phone cameras, make possible photographic image capture and distribution at a pace unparalleled in history. The division of photography into specialist fields of interest therefore represents, not the fracturization and decline of a medium, but rather the enculturation of the medium into the very fabric of contemporary life. We have become an image-making culture. No longer does a person have to pick up a camera and take on the mantle of photographer in order to create photographic images; the ability to create images is now embedded in the commonly used, everyday devices at hand, such that image making, and image sharing, has become second nature. Image and culture have become one.